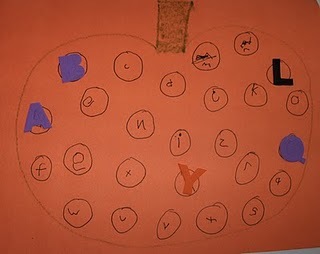 After a fun trip to the pumpkin patch last week, we’re planning a family fun night to carve our pumpkin. But with a little time to spare on a long weekend I decided to invite my girls to a Pumpkin Party Weekend. We’ll be working on activities inspired by the following great ideas I’ve found in my Google Reader this week. 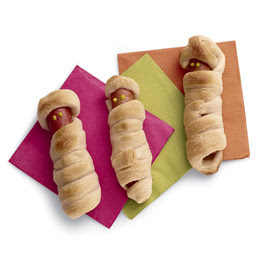 My friend Emily brought some adorable Hot Dog Mummies to the Sweet Bee’s preschool party. This is what we’ll be having for dinner on Halloween night, along with the Spooky Jello-Jigglers, and some Halloween themed pasta if I can find it at the store (thanks Courtney for the idea). I don’t think we’ll get to it this year, but some time I would like to try the Frozen Banana Ghost Treats from No Time for Flashcards.